Heat oven to 325°F. In large bowl, beat brown sugar, butter, vanilla and eggs with electric mixer on medium speed, or mix with spoon, until creamy. Stir in flour, cocoa, baking soda and salt. Stir in white chocolate chunks and nuts. Drop dough by 1/4 cupfuls about 2 inches apart onto ungreased large cookie sheet (do not use dark cookie sheet). Bake 13 to 16 minutes or until cookies are set and appear dry (do not overbake). Cool 1 minute; remove from cookie sheet to wire rack. 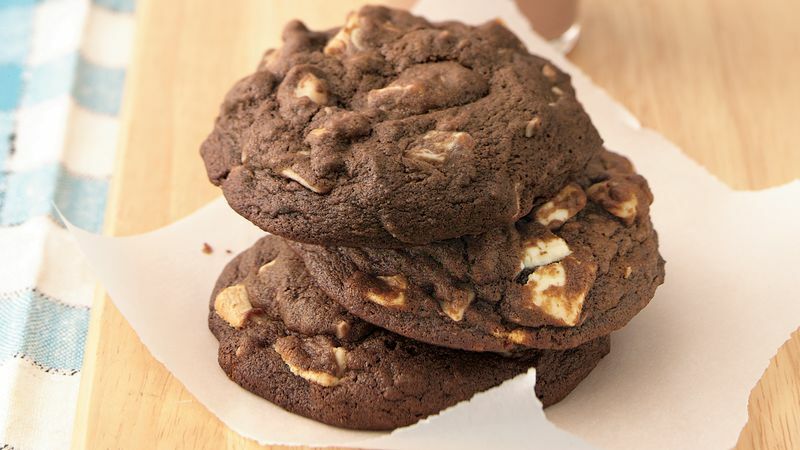 Replace the white chunks with semisweet chocolate chips for a chocolate lover's cookie. Keep cookies chewy by storing them tightly covered. Resealable plastic bags, plastic food containers with tight-fitting lids and metal tins work best.